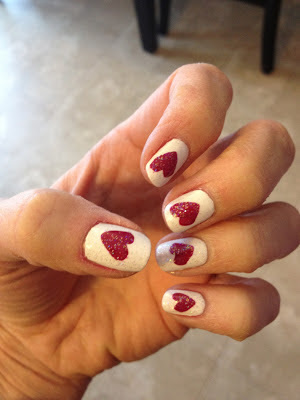 My Fashionable Designs: Valentine Nails! First I painted my nails white and allowed to dry several minutes. Second I free-handed a dark pink heart with the Sally Hansen quick-dry polish using an X-like stroke. Third I used a Sally Hansen glitter polish over top.